1 of 6 Heat oven to 425 degrees F. Coat a large baking sheet with nonstick spray. 2 of 6 Place one thawed pastry sheet on a lightly floured work surface. Cut a 1-inch strip from each long side. Brush pastry with egg wash and place strips over each long edge to form a border. Brush top of border with egg wash. Prick bottom of pastry with a fork. (see Tip). Transfer to baking sheet. Repeat with remaining pastry sheet to form a second tart. 3 of 6 Bake at 425 degrees F for 16 to 17 minutes. Transfer to wire rack to cool. Gently press down centers if puffed. 4 of 6 Prepare pudding following package directions, using half-and-half instead of milk. 5 of 6 Spread half of the pudding over each cooled pastry. 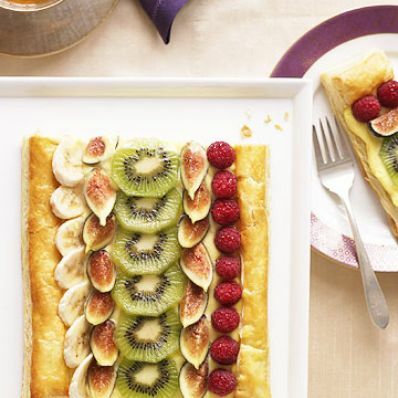 Arrange a row of each type of fruit on the two pudding-topped sheets of pastry. 6 of 6 Heat jelly until melted. Brush over fruit on both tarts. Refrigerate for at least 1 hour before serving.